In a culture where the sexualization of women not only abounds, but is also glorified, it can be difficult for girls not to compare themselves to other females. In doing so, many will feel that they just don’t measure up. And while we may not be able to completely prevent every single body-image issue from occurring, there are several things we can do to significantly help our girls to grow up to become confident woman who are comfortable in their own skin. 1) Remember that you are your daughter’s most significant body-image role model. If you weigh yourself daily, place your worth in what you eat, and compare yourself to other women, then chances are that your daughter will too. On the other hand, if you model a gentle spirit and a healthy view of body image, as well as carefully guide your daughter to do the same, then she’s much more likely to have a healthy view of herself as well. 2) Don’t speak negatively about physical appearance. If you talk about other people’s looks negatively, then your daughter will probably learn to think of outward appearances, including her own, in a negative manner. When you hear someone speaking badly about someone else’s looks, don’t join in the bashing. Just say something like, “I think she looks great,” and change the subject. Chances are that your daughter is hearing your response to more of these conversations than you realize. 3) Refrain from “rating” people. Never tell your daughter something like, “You’re chubbier than most of the girls in your class.” On the flip-side, don’t say things like, “You’re the prettiest girl in the room,” either. Both types of comments will teach her to compare herself to others. I have one daughter who really notices cultural differences in appearance. I never want to ignore her observations or pretend that everyone is the same – instead, I want to teach my children to appreciate everyone’s uniqueness. 5) Don’t tease about how much she eats. “Wow, you must be hungry today! Would you like some more vegetables?” is fine. Someone at the table teasingly calling her a piggy is not fine. 6) Keep the TV off and beauty magazines out of the house. Not only do inappropriate images tempt the males in the house, but those same images are also having a large influence over what our daughters consider beautiful. It’s a lose-lose situation and one that isn’t worth the cost. 7) Remember that actions speak louder than words. Even if you’re not speaking negatively about yourself, if you spend hours working on your physical appearance every day then you’re showing your daughter that you don’t think your natural beauty is good enough. This will filter down into how she feels about herself. If you do get carried away about your looks, recognize your mistake and use that as a teaching opportunity (like I did when I got my disastrous spray-tan)! 8 ) Model emotionally-healthy behavior. If you turn to food when you’re stressed, your daughter might too. If you weigh yourself twice daily, your daughter will probably become overly concerned about her own weight. On the other hand, if you find joy in exercising for 30 minutes a few days a week, drinking plenty of water, and grabbing an apple or banana to munch on when you need a snack, then your daughter will probably want to practice those behaviors as well. 9) Choose to enjoy preparing and eating healthy foods. And when you do have the occasional dessert together? Enjoy it with zero guilt! 10) Exercise with your daughter. Get active outside by playing a backyard sport, riding bikes, going for a jog, swimming, or even doing yard work. Complete an exercise video or play a work-out game on the Wii when you can’t go outside. Don’t talk about how much you’re hoping to lose an extra 20 pounds. Do talk about how great it feels to be able to stay active and healthy, and how blessed you are to have legs that can carry you places. 11) Talk to your daughter about growing up. I know this can be uncomfortable, but do it early and do it often. Use a book for help if you need to. I personally love “The Body Book (The Lily Series)” by Nancy Rue for pre-teens. For a teen, find a purity book about dating and marriage. Don’t just tell your daughter to let you know if she has questions and then give her a book to read on her own – chances are that she won’t ask. Take the time to actually read a growing-up book out loud together so that you can be there to discuss topics as they arise. By doing this, you’re showing your daughter that you’re a safe person to talk to about growing-up issues, which will help her to talk openly to you about other things as well. 12) When your daughter does develop a body-image issue, don’t dismiss her concerns. Listen to her. And gently help. Is she upset because all of her pants have gotten too tight? Let her know that’s a completely normal part of growing up then take her shopping for a new pair of jeans. Is she self-conscious about the zits dotting her face? Tell her she’s beautiful, then look up natural acne remedies online and help her try a few out. Maybe she’s overweight and is concerned about that, not only because of appearance, but for health reasons as well. Don’t lie to her. Do tell her she’s beautiful and invite her to exercise with you if you haven’t already done so. Buy her a pretty water bottle and experiment with putting slices of different types of citrus fruit in her water. Find joy in trying new healthy recipes together. Show her that being healthy can be fun! Show your daughter, through example and by your words, that health and beauty aren’t about shape, size, crash diets, shiny hair, or expensive make-up. Quite the opposite – being healthy is about loving ourselves enough to take care of our bodies, and even more importantly, it’s about learning and growing as a person. Because true beauty comes from within, and radiates out. What about you? 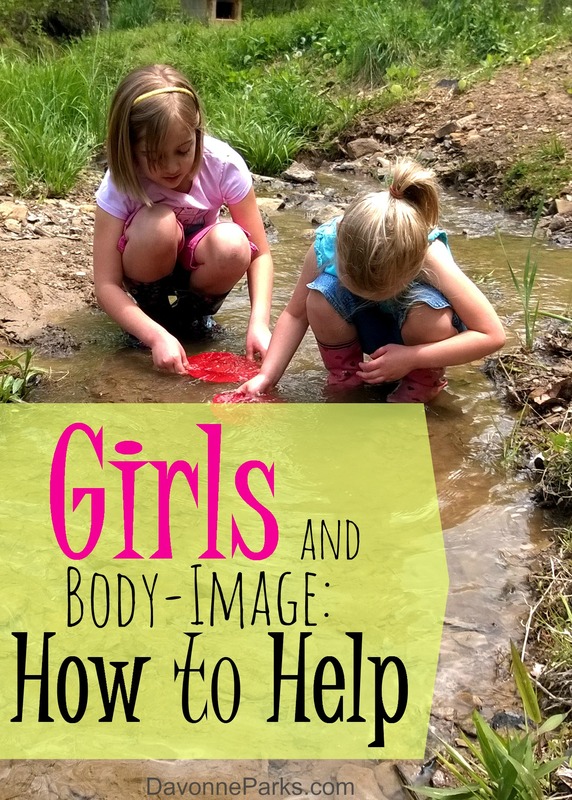 What tips do you have for helping our daughters develop healthy body images? « Can You Afford to be a Stay-at-Home Mom?